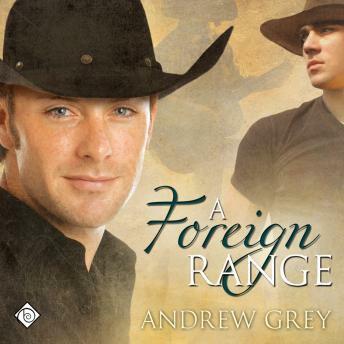 Listen to "A Foreign Range" on your iOS and Android device. Country singer Willie Meadows is a fake. He's never ridden a horse, and his "Western" gear comes from a boutique shop in LA. No wonder Wilson Edwards, the real man in those fake boots, is suffering creative block. Determined to connect with the music, Wilson buys a ranch in Wyoming to learn the country way of life, even if he has no intention of running the business. Then Steve Peterson shows up desperate, destitute, and hungry, having just escaped a gay deprogramming hospital run by his father's cult. Steve was supposed to train horses for the ranch's former owner, but the job is gone along with his would-be employer. Luckily Wilson has a temporary solution: Steve can ranch-sit while Wilson does business in LA. But when he comes back, Wilson barely recognizes the place. There are trained horses in the paddock, and the ranch is in great shape. Suddenly he finds himself inspired not by the cowboy lifestyle but by Steve himself. But the cult is still after Steve, and Wilson's fear of scandal means he's still in the closet. Coming out could kill Willie's career-but denying his feelings for Steve could kill the only part of him that's real.